Zorba the Buddha, 7 Tropical Drive, Near Ghitorni Metro Station, New Delhi - 110030. Five qualifications in 7 jam-packed, content rich, highly interactive days that will change your life forever! Breakthrough Coaching with NLP are a powerful coaching skills and tools that helps people design and live the life they truly want to lead. It can be applied in business, at work, with relationships as well as creating personal satisfaction. Venue and Address: Zorba the Buddha, 7 Tropical Drive, Near Ghitorni Metro Station, New Delhi - 110030. Accommodation: For accomodation contact the venue directly. Mention Vitality Living College on booking to secure best available rates. There are also some more hotels nearby, which you can search on booking.com. 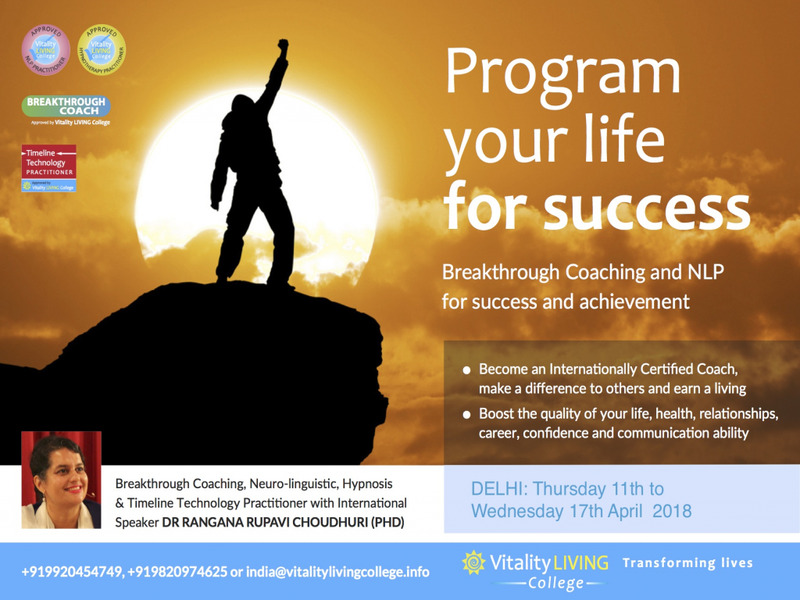 The seminar will be delivered by International speaker and trainer Dr Rangana Rupavi Choudhuri and will contain the most up to date NLP skills as well as the unique breakthrough coaching system. Dr Rangana Rupavi Choudhuri has trained with NLP masters around the world, including Tony Robbins, David Shepherd, John Seymour, Richard Bandler & Steve Linder and studies the work of Tad James, John Grinder, Robert Diltz & Virginia Satir. The early bird of Rupees 74100 is and for a limited time.